Learning guitar on your own can be tough if you don’t have the right resources. 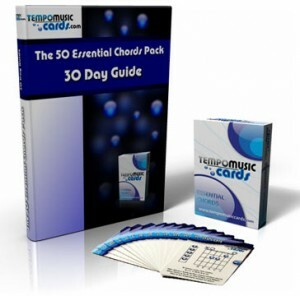 The 50 Essential Chords Flash Cards Pack with the free 30 Day Guide (eBook) will teach you 50 easy chords using lessons, advice, tips, diagrams and exercises to help you learn faster and easier. Flash Cards have been successfully used for decades in the education of language, math, geometry and other areas. College and University students use flash cards to prepare and study for exams with amazing increases in memory. The same tool can help you learn and memorize guitar chords. The 30 Day Guide included as a digital download with the Guitar Flash Cards Pack is split into three sections filled with valuable lessons, exercises and practice plans. You can expect to pay $20-30 for all the above content from a guitar instruction book. All this content is available to you for free with your guitar flash cards pack. That’s massive value. The 30 Day Guide is like a virtual tutor to coach you through the chords using effective exercises and practice plans. The 30 Day Practice Plan has been used by many students to learn guitar on their own without any help of an actual tutor. Learning all the material in the eBook along with all 50 chords with a teacher can literally cost hundreds of dollars over several months. This package can teach you all the above for the price lower than one single lesson. My son Steve has wanted to play guitar for quite some time but never had the motivation to actually try it out. I decided to finally buy him a guitar with a few books and came across these cards. Such a great idea – Steve loves them, it reminds him of the memory card games he played in early school years. Steve’s been using the cards for over a month now and they seem to be doing the trick, he’s still motivated and practices often. Thanks. You can read feedback from other guitarists who have used the pack here. 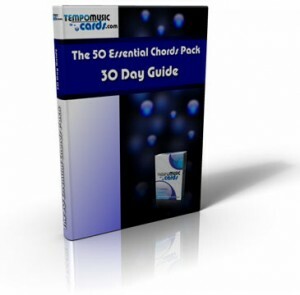 The 50 Essential Chords Pack can be delivered anywhere around the world at a fantastic price. While you wait for your pack to arrive you can download the free 30 Day Guide instantly to read through the lessons and prepare to use the 30 Day Practice Plan. Get a head-start on your guitar playing. 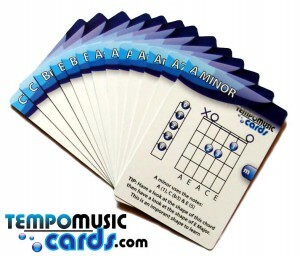 Get your Guitar Flash Cards Pack and the free 30 Day Guide Digital Download now for just $15.99 $12.99.